Okay purpose of this post is very simple to explain you why Knockoutjs. I will try to put it in simplest way that Why we need to work Knockoutjs. If you are not a begineer then probably this post may appear very simple to you. However I request keep reading this post. Let us start with an application as given below. Application got two input box and a span to display a message. When data changes in input boxes notify back to data source. Next we need to bind this data to input boxes element on DOM. This can be done using jQuery selectors. We need to select elements and assign values to elements. One major problem in above implementation is that if you change Product Name or Product Price, it will not get notified to data source. Here you are pulling data from the data source and there is no binding between elements and data source. In simple words when you change value of Product Name or Product Price custom message will not change by default. Off course you can implement it using jQuery but that would be complex. In this requirement we will create only ViewModel and View. You can see in View implementation that we are binding Product Name, Product Price and Message to different elements. To create computed observable you need to pass a function and name of the ViewModel. Note that there are various ways to create ViewModel. For purpose of this post we followed this approach to add computed observable to ViewModel. As last step we need to apply binding or link ViewModel to a Node on DOM. If you want to bind ViewModel to whole body then you can skip second parameter. Now let us go ahead and run application. In above application when you change value in any of the input boxes, immediately message in label will be changed. 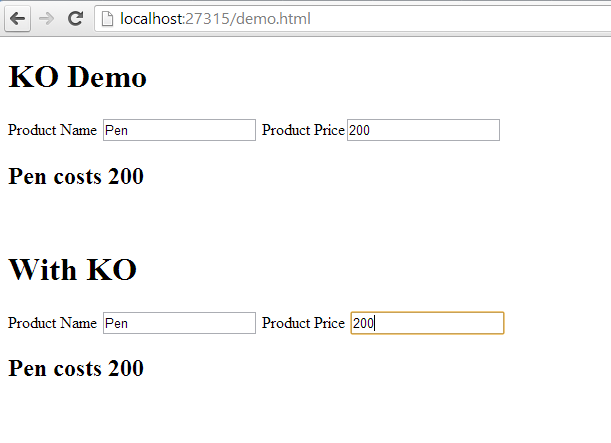 So we witnessed that two way binding and automatic UI refresh is very simple to implement using Knockoutjs. I hope you find this post useful. Thanks for reading.